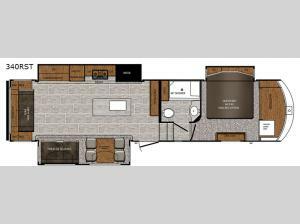 When you take this Crusader fifth wheel out on your family's next adventure, you'll be camping in comfort and with all the amenities you enjoy at home. The front private bedroom gives you your own space to retreat to each night. This unit includes three slides, giving the kids room to play with the dog on the floor. With a kitchen island, a pantry, and plenty of overhead compartments, you'll have all the room to store food and prepare a family dinner. After a day of hiking, clean-up in the full bathroom that includes a shower with a seat for your convenience. This fifth wheel also includes an space that has been prepped for an optional washer and dryer if you choose!